I have Cecilio CVN-EAV I bought new. I have been as most know on the chat site, chasing the right sound. I even named my violin the Soulless Wonder. I changed the strings, moved the sound post, anything to get more life out of it. I finally got brave, and with a cheap blank to practice on started shaping a Bridge. As I had found out that the one that comes on the violin was to thick. so calipers, files, acxto knife and sand paper in hand, I plunged in. I cut the new bridge to these specs. Don't get me wrong, I would recommend any one to buy from Cecilio. But if you are like me and want more depth, have a luthier look at the bridge. And of course this disclaimer "this is all IMHO"
While it's true that a good bridge can make a big difference I would caution about thinning out the bridge that much. The trouble with making the bridge that thin is that it probably will warp. Those specs apply mostly to the hardest bridges materials and not the cheap blank that you bought. Also, make sure you keep your bridge very straight to avoid it warping too soon. 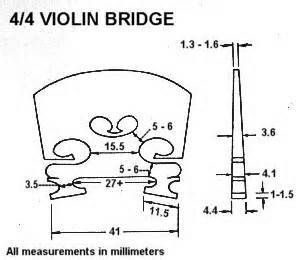 Though I have seen similarly thin bridges I've also seen and played on great violins with much thicker bridges as well. this was a test craving to see if I could get it right. I have a Despaiu Superior Blank coming for next try. I'm hoping to get the same results from it as I did this test blank. Oh and the original is 5.5 at foot 5.3 at knee 4.8 at mid and 2.7 at top. And it look to be a harder maple then my test piece.